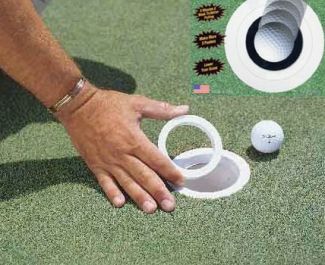 The No 3 Putt Cup Reducer fits snugly inside the hole to make your practice cup smaller, and does not damage the green. Similar to the familier drill of putting toward a tee, the No 3 Putt Cup Reducer has the added benefit of actually allowing you to hole puttts. The addition of the smaller inner ring makes the hole even smaller, giving the psychological effect of making a standard size hole seem much bigger than it actually is. This effect can be a very powerful confidence builder on those crucial two footers. Place the No 3 Putt in the cup with your hand, foot or putter. Level the rings to the top of the putting cup. Practice putting by using both rings on short putts (3-5 feet). Remove the inner ring when practicing longer putts. When it comes to the ‘real thing’ the hole will look the size of a ten gallon bucket!